Please, raise your hands anyone who DOESN'T love potatoes? I thought so too, not many. Do you know how much I love potatoes? From simple mushed or baked potatoes to elaborated stuffed potatoes, you name it. There are some discussions about how much if any potatoes one can consume to be healthy and loose weight. I believe in one thing: eating a good food, whole, fresh, organic, and non-GMO in moderation will do only good for me and my family. Want to loose weight, calories "In" have to be less than calories "Out". Want to maintain weight, calories "In" have to be equal to calories "Out" (or a little less). 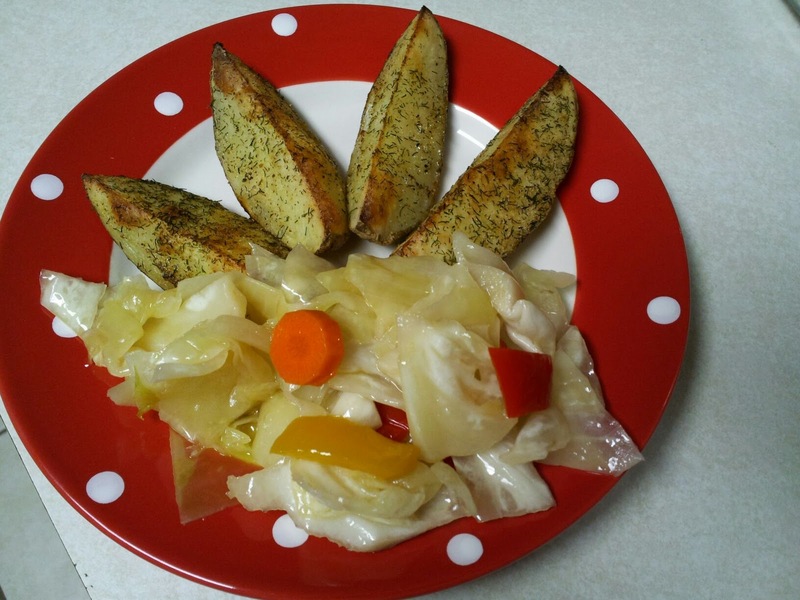 Ingredients - potatoes and seasoning. Wash and cut lengthwise 5-6 medium size potatoes (I love Russet potatoes, as you can see). Place all the wedges on the oiled baking sheet, skin down. Season with salt, pepper, garlic granules and dill weed. Drizzle a little oil on the top. Bake 35 minutes until golden brown and taste it. Enjoy with anything you like. My choice for today was a cabbage salad. How do you like your potatoes (if any)? I love potatoes and enjoy them! My difficulty is preparing them in a healthy manner. They are always begging for butter, cream and cheese! 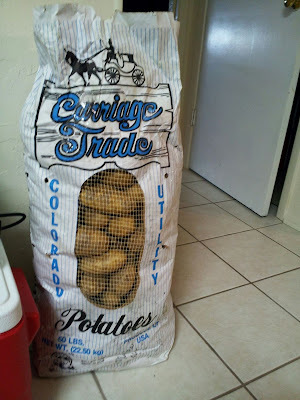 BTW - that is an AWESOME sack of potatoes! To the point! I liked this post!! Kale Tuesday, and What Was in That Box?